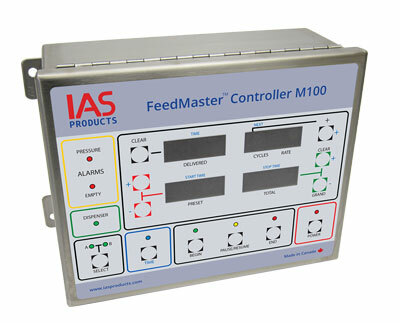 The FeedMaster™ Controller is a feed control module designed to dispense operator set quantities of feed and track daily and accumulated feed dispensed volumes. The large IP68 rated control buttons, easy to view digital display screens and simple feed management control and safety alarms make this controller ideally suited for work with all IAS Products model MiniMax™, AeroSpreader™, HydroSpreader™, and AutoSpreader™ feeders. Behind the scenes each FeedMaster™ Controller is designed to manage proximity sensors for feed hopper level control as well as center-less augers and rotary valves rotational speed for feed rate and volume dispensing purposes. Bright LED feed control alarms provide immediate information on low feed storage volumes and low blower operating pressure. The large easy to view face panel positions four large digital screen displays and large control buttons provide the operator with the up/down number entries to set feed rates, feed dispensing volumes, and dispensing cycles. Additional buttons offer operator selection of feed delivery locations and access to daily and accumulated feed dispensed totals. To ensure feed delivery is properly managed, immediate operator control is provided with Begin, Pause, and End buttons each matched with a corresponding bright LED indicator light. Feed delivery is as easy as entering the amount of feed to be dispensed (1-9999) using the up/down buttons beside the preset screen, setting the feed rate (1-99), selecting the number of repeat feed cycle events (1-9) and pressing the Begin button. The FeedMaster™ Controller will commence with feeding showing an ever growing Delivered amount on the screen until Delivered = Preset whereby the controller will respond to operator entered commands to repeat the feed cycle, switch to a second delivery location, or stop. Digital metering system provides accurate feed dispensing rates to ensure feed dispensing tracks best-feed table profiles. Monitor hourly, daily, or weekly feed dispensing amounts to feed bag counts for accurate monitoring of feed conversion rates. Minimize feed waste with immediate feed dispenser END override. Press PAUSE to monitor feed cameras or make feed equipment adjustments. Bright full sun view digital screen displays and bright LED indicator lights provide immediate operator information feedback to ensure all feed best utilized.